Nepal PM asks India to end "undeclared blockade"
Nepal's newly elected prime minister KP Sharma Oli called Sunday on neighbouring India to end its "undeclared blockade" as the nation faces crippling shortage of fuel and supplies. Scores of trucks have been stranded at a key border checkpoint between India and Nepal for over a month following protests by ethnic minorities over the Himalayan nation's new constitution. The movement of cargo across other Indian border checkpoints has also slowed to a crawl, prompting authorities in Kathmandu to accuse New Delhi of imposing an "unofficial blockade" to show its dissatisfaction with the new charter. New Delhi has denied the charge and urged dialogue with the protesting Madhesis, who have close cultural, linguistic and family ties to Indians living across the border. 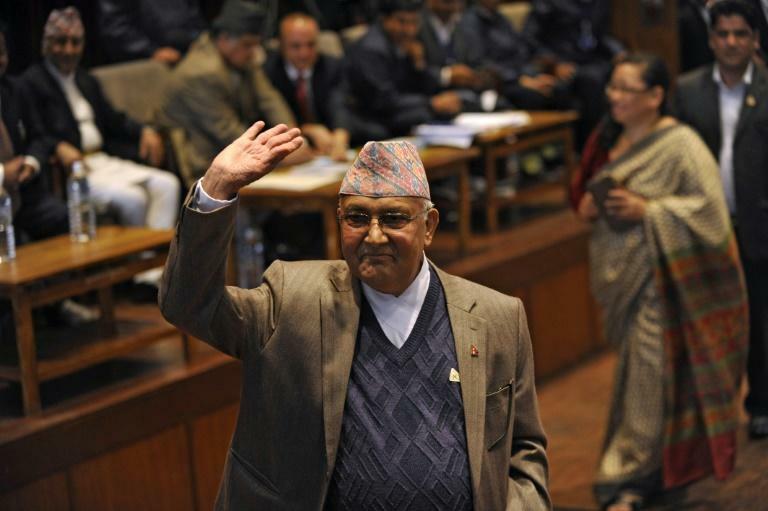 "I strongly request the government of India and related officials... to immediately end the undeclared blockade and resume supply of essential goods and not let further negativity grow in the centuries-old relationship between the two countries," Prime Minister Oli said in his first address to the nation since taking office. Oli said that Nepal, recently hit by a massive quake that killed nearly 9,000 people, is facing a serious humanitarian crisis because of the blockade with a shortage of fuel and medicines. "The economic, social and psychological damage caused by the ongoing protests and the undeclared blockade is several times more than the quake," said Oli. The prime minister also called on the protesting parties to solve the issue through dialogue, adding that the constitution can be amended and the federal borders can be revised. The constitution, the first drawn up by elected representatives, was meant to cement peace and bolster Nepal's transformation to a democratic republic after decades of political instability and a 10-year Maoist insurgency. But it has instead resulted in deadly violence. More than 40 people have been killed in clashes between police and protesters representing ethnic minorities who say a new federal structure laid out in the constitution will leave them under-represented in the national parliament.